Why the Big Advancement in the Signature Series Line? Simply put, we reformulated Signature Series Synthetic Motor Oil to solve problems. For all the derision heaped upon the internal-combustion engine, it remains our primary mode of propulsion. And, despite the gains of hybrids and electric vehicles, it will remain so for the foreseeable future. One reason is the tremendous efficiency gains gas and diesel burners have made since the 1970s. The loud, proud cast-iron powerplants of yesteryear may still quicken your pulse when they roar past powering a hot rod or classic car, but they can’t match the fuel economy and reduced emissions of the engine likely powering the vehicle you drove to work today. That’s due to the widespread use of turbochargers, direct fuel injection, variable valve timing and lightweight materials. But, despite their many benefits, modern engines present several challenges, and it’s up to the motor oil to solve them. One of the biggest is low-speed pre-ignition (LSPI). If you read the AMSOIL blog, you’ve heard about LSPI by now. LSPI is such a big deal that it’s the driving force behind the next generation of motor oil performance specifications. 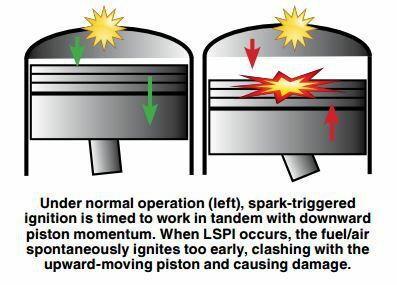 In a nutshell, LSPI is the spontaneous ignition of the fuel/air mixture prior to spark-triggered ignition. 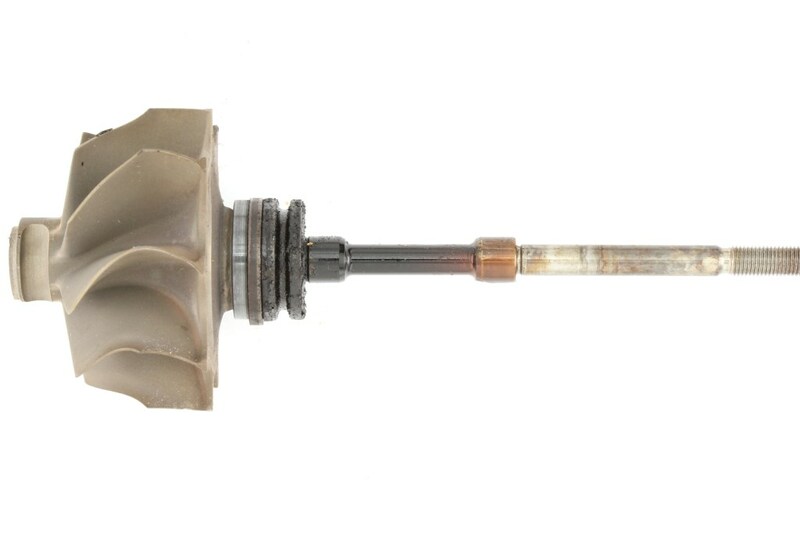 It occurs in modern turbocharged, gasoline-direct-injection (T-GDI) engines, and it’s another version of pre-ignition, which has been around since engines were invented. In this case, though, it occurs under low-speed, high-torque conditions and is much more destructive than typical pre-ignition. Automakers can program their vehicles to avoid operating conditions that invite LSPI. The problem, though, is that programming the engine to operate on that “ragged edge” that invites LSPI promises fuel economy gains of up to 10 percent. With CAFÉ standards looming, automakers are eager to realize those efficiency gains. But they can’t until motor oils hit the market that help prevent LSPI. 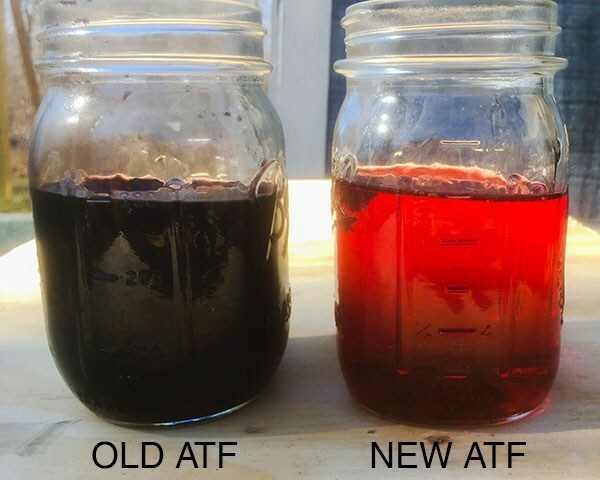 Motor oil formulation plays a big role in fighting LSPI, so much so that the next generation of motor oil specifications requires oils to pass an LSPI test. The forthcoming API SP and ILSAC GF-6 specifications aren’t scheduled for introduction until fall 2019, however. Some automakers have grown impatient and have requested that the API, which licenses ILSAC GF-5, supplement the current specification with an LSPI test requirement. That could happen as early as January, 2018. General Motors is ahead of the game. Its proprietary dexos1® Gen 2 spec, introduced in August, includes an LSPI test. Which brings us back to Signature Series. We want our flagship motor oil to stand alone as the best motor oil in the world, and preventing LSPI is one prerequisite to achieving that goal. So we subjected it to an LSPI engine test. The result? Signature Series Synthetic Motor Oil provided 100 percent protection against LSPI* in the engine test required by the GM dexos1 Gen 2 specification. In short, the oil solves a major problem plaguing the industry right now. What about the old standbys, like engine wear and extreme heat? Here, too, Signature Series excels. From the day your engine fires to life, friction tries to wear away bearing surfaces, cylinders, piston rings and other components. Left unchecked, it’ll render your pride and joy a gutless, wheezing shadow of its former self. Eventually, something can break completely. We formulated Signature Series to deliver next-level wear protection. But we know you want proof, not promises. In the API Sequence IV-A Engine Wear Test required for the API SN specification, Signature Series delivered 75 percent more wear protection than required**. An engine that lasts for years and delivers maximum horsepower long after you’ve made the final payment. To prove it, we installed Signature Series 5W-30 Synthetic Motor Oil in a Ford F-150 with a new 3.5L Ecoboost engine to test its ability to protect turbocharged direct-injection engines from torque and horsepower loss during extended drain intervals up to 25,000 miles. Power sweeps were done at the beginning and end of the test to evaluate horsepower and torque retention. 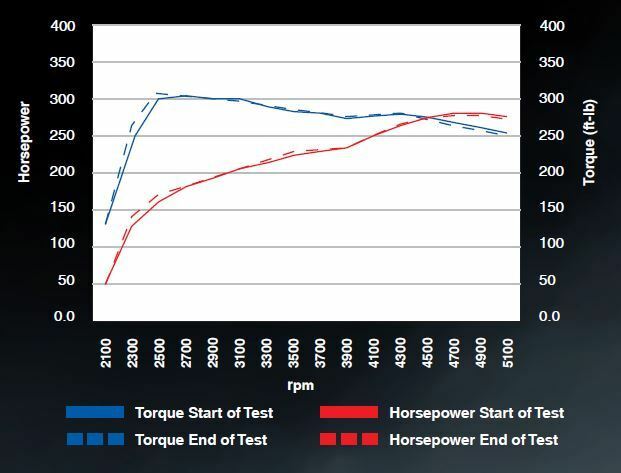 As the graph shows, Signature Series helped maintain engine performance throughout the 100,000-mile test. Engine deposits, too, do their best to sideline your vehicle. High heat can breakdown motor oil, leading to piston ring, piston crown or valve deposits, which erode horsepower and efficiency. In severe cases, your engine can fail altogether. Heat is more prevalent in T-GDI engines. Turbos run on exhaust gases that can exceed 1,000ºF and can spin more than 150,000 rpm. The turbo’s center section contains an oil-lubricated bearing. The tremendous heat and stress turbos create can cause some oils to break down and form harmful bearing deposits, known as turbo coking. Over time, turbos can suffer reduced performance, or fail completely. Again, Signature Series solves the problem of extreme heat. We challenged Signature Series to the GM Turbo Coking Test, which consists of 2,000 cycles of extreme heat soaks. An oil must limit the temperature change within the turbocharger to 13 percent or less to pass the test. Signature Series limited the temperature increase to only 3.6 percent, protecting the turbocharger 72 percent better*** than required by the GM dexos1® Gen 2 specification. Signature Series controlled heat and minimized performance-robbing deposits on the turbo bearing and shaft surfaces. 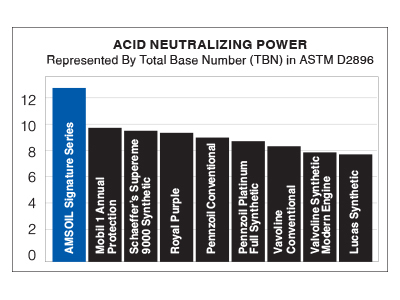 And, lest we forget, the performance of Signature Series Synthetic Motor Oil lets you extend drain intervals to 25,000 miles/one year if you choose, even in turbocharged engines. With challenges to engine protection and performance mounting – and new problems cropping up – it’s vital we stay one step ahead. That’ll help you continue to get the best protection and most years out of your vehicles. * Based on independent testing of AMSOIL Signature Series 5W-30 motor oil, in the LSPI engine test as required for the GM dexos 1® Gen 2 specification. ** Based on independent testing of AMSOIL Signature Series 0W-20, in ASTM D6891 as required by the API SN specification. *** Based on independent testing of AMSOIL Signature Series 5W-30 in the GM turbo coking test.